Mike writes, I've been trying to embed a Windows Media Player on my website and have it play from a library. I've figured out the part of embedding the player itself but cannot figure out how to get the player to play from a list of mp3s elsewhere on my site. You could create an ASX file that calls each of the files and then link to that ASX file from the embedded Windows Media Player, but I've never had that work consistently without setting up Windows Media Services on a Windows server. Using a simple ASX setup doesn't allow for easy skipping between tracks or any of the normal play controls you might expect from most of the common media players. The only easy way to build an embedded playlist with Windows Media Player is to have a server running Windows Media Services hosting all the files. A better alternative is to setup an embedded Flash based player designed for playing back files. The quickest method for setting up a Flash based audio player is to purchase Wimpy MP3 (the same company also makes a video player). 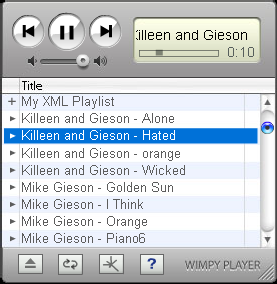 It offers a wide selection of skins, including one that looks a bit like iTunes and a mock iPod to embed on your page. All you need to do to make Wimpy work is upload the application files to the same directory where the MP3s are stored on the server and paste the HTML code for the Wimpy app onto any page you want to have listeners playback your audio files. The app is used by a number of musicians and podcasters for playing back tracks. The Geek News Central podcast is probably the best known podcast currently using Wimpy. You can see it in action on their podcast page. More advanced configuration options include choosing the track order, so that the song you want first in the list shows up, as well as configuring a number of options about how the player works. At the most basic level, you simply upload the Wimpy files and it just works.